The road to the NCAA Tournament is paved by overcoming challenges, game after game. Whether it’s a heated rivalry game or a shootout against a top team, each opponent must be approached with a game plan for success. With the 2018-19 NCAA Men’s basketball season fast approaching, the Mount St. Mary’s team has just a few days left to fine tune its offensive and defensive strategies before the start of its climb back to the team’s ultimate goal: competing for a national title. With a new head coach and a team entirely made up of freshmen and sophomores, there is plenty of room for growth as the season progresses. But what this Mount St. Mary’s squad may lack in experience, they make up for in explosiveness, tenacity, and a solid game plan. Just two seasons ago, the Mount made the leap that every Division I basketball team hopes for: playing for a national title. Mount St. Mary’s entered the dance as a 16 seed and faced off against No. 1 seeded, Villanova University, keeping up a competitive first half before eventually falling to the Wildcats. While the team’s tournament did not have a fairytale ending, it did prove that Mount St. Mary’s was not out of place competing at the highest level, and that competitive level is something the Mount is going to have to replicate this coming season to make a deep run into the post-season. The entire team, from the players to the coaches, know the season begins even before the team’s first game. “What we bring [to practice] every day is going to be directly reflective of what happens on the court,” Engelstad said. Finding that rhythm early is going to be key for the Mount as it enters potentially the toughest stretch of the season. Engelstad’s group begins seven of its first eight games of the season on the road, but he is ecstatic to return as a coach in his home state. The Bethesda native looks to start his team’s season strong, making his Mount St. Mary’s debut as head coach in Raleigh, North Carolina, against NCAA tournament hopefuls, North Carolina State University on November 6. 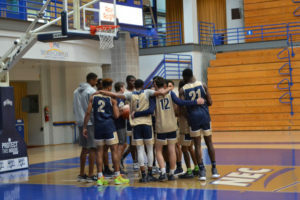 The Mount St. Mary’s Basketball Team makes every practice count, fine tuning its offensive and defensive strategies, ready for a successful season ahead.